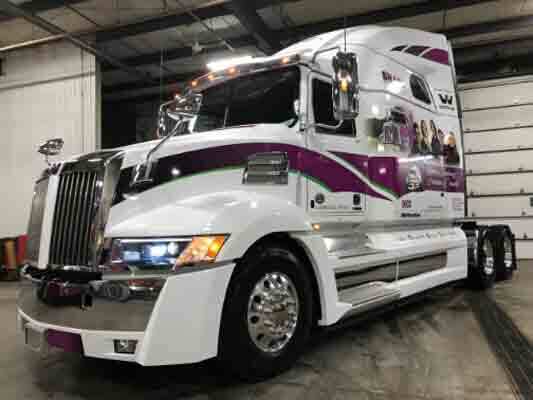 The Women’s Trucking Federation of Canada (WTFC) recently unveiled a 2019 Western Star 5700XE with a promotional wrap featuring the organization’s name and pictures of its members. The 5700XE model, which is owned by Sharp Transportation Systems, has been named “Miss Destiny Star” by company driver Shelley Uvanille-Hesch, founder of the WTFC and a tireless champion of women in the trucking industry. “I will be driving this truck across Canada and into the United States and I know everyone who sees it will be a little more aware that women do work in trucking and that it’s an industry that can provide a good living for them,” Uvanille-Hesch said. Several years ago, she contacted Western Star to ask for the company’s support of the WTFC. Since then, Western Star has been a corporate member of the organization and funded the truck wrap. The WTFC has worked closely with the group at Highway Western Star in Ayr, Ont., the dealership where the 5700XE was purchased. Since its founding in 2014, the WTFC has grown to more than 300 members. It’s active on a number of fronts, from mentoring women in driving school and hosting career events at high schools to giving interviews to polish the public image of truckers. The federation also is involved in several charitable causes and appears at industry events to gain visibility and recruit women drivers, managers, dispatchers and technicians. The 2019 Western Star 5700XE is an ideal truck to raise awareness of the WTFC. The 5700XE already turns heads with its striking aerodynamic design and classic Western Star style, and the wrap, as well as a custom-designed blue-and-pink LED lighting scheme, are guaranteed to draw attention. When Uvanille-Hesch isn’t driving it, the truck will make appearances at shows and charitable events in Canada.